One last, but important, thing a beginning knitter needs to know is how to make a gauge swatch. This will help you with following patterns to make all sorts of knitted gear. What is “gauge” in knitting? My knitting pattern wants me to “check my gauge” before I start. But what does that mean? Knitting gauge is a way of measuring how big your stitches are. Stitch size can vary from person to person based on how tightly they loop the yarn around the knitting needles. Checking your gauge helps to make sure your stitches are the right size for your project. Gauge is a way of measuring the size of your stitches. If you use a bigger knitting needle, your knitting will have a larger gauge. Likewise, a smaller needle knitting up the same yarn will create a fabric with a smaller gauge. Many yarn labels and most knitting patterns provide a gauge to help you determine the finished size of a knitted garment. In patterns, you are asked to check your gauge to ensure that you make stitches of the same size as the pattern writer. If your gauge is bigger than the pattern writer’s gauge, you will knit an item that is too big. The same yarn knitted on different sized needles can have very different results. Checking your gauge ensures your stitches are the right size for your project. On the other hand, if your gauge is smaller than the pattern-writer’s gauge, you will knit an item that is too small. So, it is a good idea to check your gauge with a “swatch” first. If your size is off, you can adjust your needle to match the pattern writer’s gauge before you get started on the main piece. Most often, knitting gauge is measured by making a 4 x 4 inch square using the needles and yarn called for in the pattern. Sometimes gauge will be measured in 1 x 1 inches. I recommend making a full 4 x 4 inch gauge swatch unless you are working with very thin yarn on small needles; this will give you a more accurate estimate of your average stitch size. How to check your knitting gauge. Usually, gauge is checked by knitting a small practice square with a given number of stitches and rows. 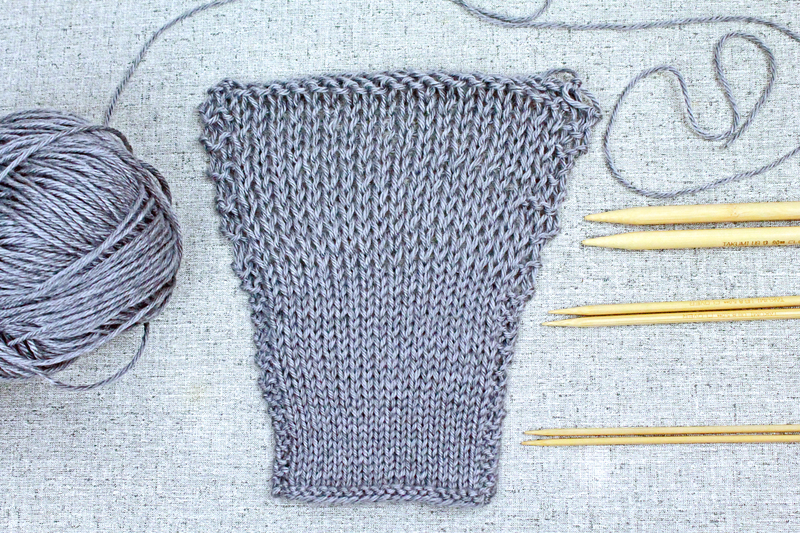 After knitting the practice square (a.k.a “gauge swatch”), you will measure the square to see if you knit with the correct tension or tightness in your stitches. The simplest way to check gauge is to cast on the number of stitches listed in the gauge pattern. Then, usually in stockinette stitch (knit one row, purl one row, repeat), you will knit the number of rows the gauge pattern calls for. Measure your square against the gauge measurement. If your square is too big, use a smaller sized set of needles and make a new gauge square until your square is the right size. Or, if your square is too small, use a larger set of knitting needles and try again. 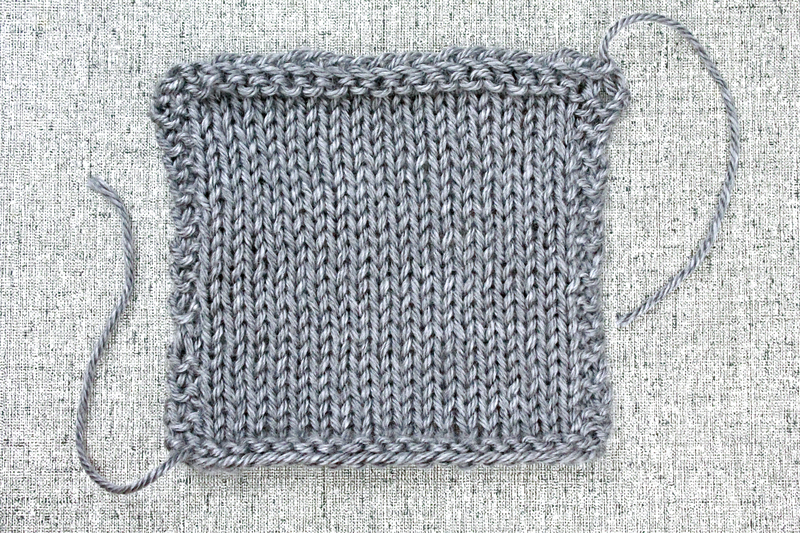 Because stockinette stitch tends to curl at the edges, it can be tricky to measure a simple gauge square. To make this easier, you can add a two row and two stitch border in garter stitch (all knit stitches) to the gauge square. Do this by adding four stitches when you cast on. Knit two rows, and begin your stockinette square, adding two knit stitches on both ends of your rows. After you’ve knit all the gauge rows, add a two-row garter stitch border. If the gauge has an odd number of rows, you can simply add one knitted row and bind off. If the gauge pattern called for an even number of rows, knit those rows, turn, then add the following border: Knit 2, purl the number of stitches called for in the gauge, knit 2, turn. Bind off. Translation: If you knit a square of 18 stitches and 24 rows in stockinette stitch on size 8/5mm needles, it will measure 4 inches by 4 inches. Row 1: Cast on 18 stitches + 4 (22 stitches), turn. Rows 5 thru 26: Repeat rows 3 and 4. Measure square inside the border you’ve created. This square should equal 4 inches by 4 inches. If it is too big, select a smaller set of knitting needles and try again. If the square is too small, select a larger set of knitting needles and try again. When you shouldn’t skip this step. I’ve been told that you should never, ever skip the gauge check. Well that seems just a little daunting. So, here is my advice: when size matters, you shouldn’t skip a knitting gauge check. If you are making a blanket or dishcloth, for example, and you do not care if it turns out a few inches larger or a few inches smaller than the pattern predicts, go ahead and skip the gauge. Just know you’ll be gambling with the size of your knit. On the other hand, you will want to check your knitting gauge when the size of your finished knit matters to you. Especially for wearable knits like hats, gloves, and sweaters, you’ll want to be sure to check your gauge. If you don’t, you may knit too tightly and end up with an extra small version of what you wanted. Or, you could knit too loosely and your pretty knit will be too big and swallow you up. When it feels like an annoying extra step at the beginning of an exciting project, just remember, you don’t want to waste all that precious time and gorgeous yarn on the wrong sized item. Hooray! You’ve completed my easy guide to learning to knit. Check out all of my knitting patterns here if you need some fun creative ideas for your next knitting project. you appear to be you know what you’re talking about! Aww thanks Rina. Glad you found the site. Wonderful website you have here but I was curious about if you knew of any discussion boards that cover the same topics discussed here? I’d really love to be a part of online community where I can get feed-back from other experienced people that share the same interest. If you have any recommendations, please let me know. Bless you! Check out Ravelry.com for a knitting/social media experience. It’s a great site.